Kuriology : Cabinet of Curiosities Art and Oddities : The Kissing of Frogs & other Kurious-Things, so where's the Prince? The Kissing of Frogs & other Kurious-Things, so where's the Prince? Having spent an entire day making youtube material, blogging, tweeting, etsy-ing, tweaking tabs & titles, & posting on forums, photographing, creating another social media website profile...I actually wanted to 'make' something tangible! Late last night all domestic chores were complete, Tik-ma-dog had had her last walk, elderly mother attended too ...sit down cup of coffee, watch TV. Fidget, fidget, fidget. No, I need to make something, & something I'd not tackled before. Now it is true to say I kissed the frog/toad...but there was no puff of smoke, no thunder flash & no prince. I'm seriously beginning to think fairy stories are highly over rated. However, Me thinks this froggie fella & mates is definitely a future creation line for the kuriology etsy shop . 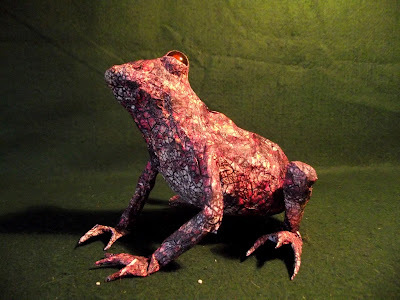 That is if I find time to make more froggies in between making youtube material, blogging, tweeting, etsy-ing, tweaking tabs & titles, & posting on forums, photographing, & creating social media website profiles. Stop. I now seem to have gone full circle.